Barcelona completely outplayed reigning champions Atletico Madrid, with Neymar, Lionel Messi and Luis Suarez’s excellent combinations particularly impressive. Luis Enrique fielded Ivan Rakitic rather than Xavi Hernandez in midfield, and played both his attacking full-backs in tandem. The most interesting part of Diego Simeone’s team selection was the decision to play Jesus Gamez, usually a right-back, on the left of his defence – regular left-back Guilherme Siqueira was on the bench, and presumably not 100% fit. Barcelona’s performance in isolation was more interesting than the clash between the systems, and after a week of turmoil this was a desperately needed victory for Luis Enrique. The key battleground in the opening stages was Messi against Gamez. Messi was used in a right-sided forward position, the role where he made his name at Barcelona, rather than as a false nine or a traditional number ten, the positions he’s played more recently. Because Atletico defended very narrow, Messi found plenty of space towards the touchline and gave Gamez an extremely difficult evening. Messi simply had the beating of the full-back almost every time he got the ball, and while theoretically Gamez’s right-footedness should have helped against Messi skipping inside, in reality Messi left him for dead before he could make a tackle. More important than Messi’s contributions on the ball, however, was simply the fact he was seeing so much of it. Atletico had prevented him from scoring in their previous seven meetings, primarily because they played so deep and so compact that Messi never received the service to influence the game. Here, this wasn’t a problem as he had oceans of space out wide. And forcing opponents into a number of clumsy tackles. Both Atletico full-backs were booked, and it was surprising neither got themselves into further trouble. Indeed, the quick distribution into the feet of Messi (and the other two forwards )was the most obvious feature of Barcelona’s collective play, and the main reason Atletico looked so poor defensively. Simeone’s side are outstandingly well-organised when they have men behind the ball, with the two forwards effectively becoming extra midfielders and allowing the actual midfielders to play very deep in front of the defence. 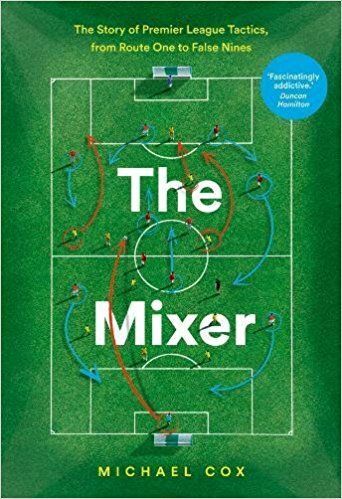 They usually concede space out wide, but the wide midfielders spring into action to shut down players on the flanks with the whole midfield shuffling across the pitch to prevent spaces between them developing. Their defensive transitions are also usually very good. However, here they seemed hugely surprised by Barcelona’s quick balls into the front players, and their defence looked extremely vulnerable when high up the pitch, lured into one-on-one challenges and concerned about the space in behind. When Atletico don’t have eight men behind the ball, they look much less secure. The use of Rakitic seemed particularly important in this respect: whereas Xavi epitomises Barcelona’s patient passing play, Rakitic looks ahead more quickly and makes Barcelona’s passing flow forward. Xavi could do that at his peak, too, but probably lacks the dynamism for that approach now. 1:20 in the highlights (link above) is a good example of Sergio Busquets looking immediately for Neymar on the break. 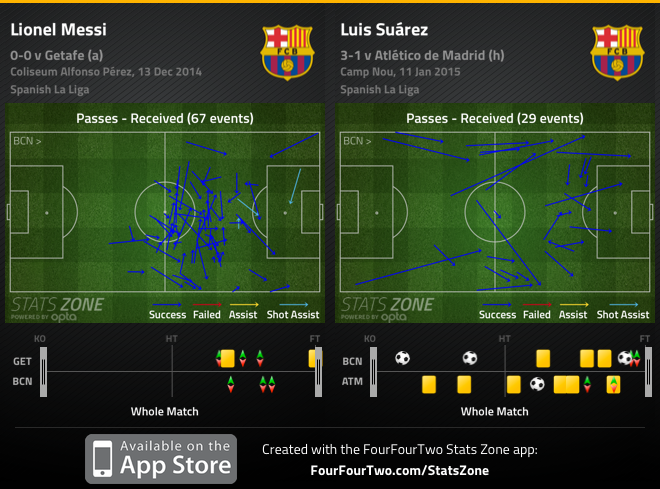 The use of Suarez in the centre-forward role was particularly useful at enabling these quick forward passes. During Barcelona’s many meetings with Atletico last season, Messi was surprisingly frustrating with his movement, usually starting centrally and making movements towards the play, into the zone occupied by Atletico’s midfielders. He wasn’t particularly keen to move laterally: sometimes drifting wide to the right but doing with little urgency, and unable to make runs in behind because Atletico defended so deep. Suarez was different. The movement Messi used to make, deep from a central position, was the one movement Suarez didn’t. Instead, Suarez concentrated on making sudden, quick lateral sprints, collected the ball in the channels, and sometimes ran in behind, too. Suarez was actually playing as something of a decoy – his job was about facilitating the attacking of Messi and Neymar from the flanks, both by creating space, and by playing passes. At 1:20 in the above highlights, his lateral sprint puts him in a position to tee up Neymar for a chance, and at 3:10 his lateral run (and Neymar’s reverse movement) creates space for his goal. At 2:15, meanwhile, you can see him running the channels and floating a beautiful cross onto Neymar’s head. He does something similar at 5:48 in the lead-up to Messi’s goal. 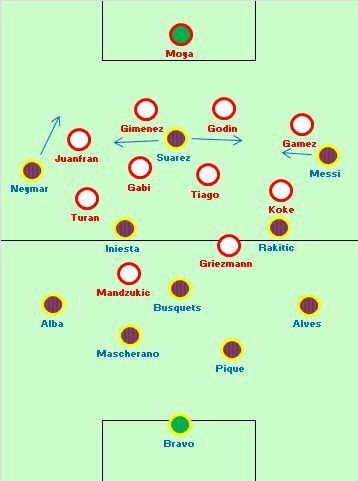 Midway through the first half, Simeone switched to a 4-2-3-1ish system by moving Antoine Griezmann deeper and attempting to block up the midfield, but it didn’t cause Barcelona particular problems. Rakitic and Andres Iniesta took up fairly wide, fixed positions and rarely moved forward to join the front three. Barcelona’s direct passing, as well as being an excellent attacking weapon, also worked excellently defensively. Usually Barca build up play gradually, push both full-backs forward and allow their midfielders to advance, which then leaves them exposed to Atletico’s rapid attacking transitions, with the wide players breaking forward. But because Barcelona left the attacking to the front three, players in deeper positions weren’t dragged forward and out of position, so Atletico rarely got the chance to counter-attack. Only one incident (5:18 on the above highlights) where substitute Fernando Torres nearly reached Mario Mandzukic’s cross, is memorable for Atletico being a threat on the counter, and it’s when Alves and Alba are both on the edge of the opposition box. That was very atypical of Barca’s approach, and it’s not clear why they were in those positions at 2-1 up. Atletico got back into the game in the second half, partly as Simeone made attack-minded changes (although he essentially kept the 4-4-2 shape, having reverted to it at half-time) and got a goal back through Mandzukic’s penalty, but they were strangely subdued for most of the game. Barca’s front three dominated this game. This is what Luis Enrique wants from his players – quick passing into the front three, and those players combining regularly. Messi, Neymar and Suarez got on the scoresheet, and their relationship together looked very good in general play. In midfield, Barcelona are more functional than we’re accustomed to, while the overall passing patterns and movement aren’t anywhere near the level of the Guardola era. Barcelona are more compartmentalised than previously, although it’s worth remembering that in the days when Barca used Messi, Samuel Eto’o and Ronaldinho as their front three, it wasn’t an entirely dissimilar situation. Historically, Barcelona’s 4-3-3 has often been used primarily to support the use of three quick, superstar attackers together, and therefore Luis Enrique is arguably returning to the football Barca are accustomed to. why didn’t Juanfran play on the left with gamez on the right? Great article Michael. I’ve read the other stuff you do for Fourfourtwo and ESPN but your ZM work is still my favourite by far. Welcome back! Hey Michael did you watch the Rome derby? I was hoping you would cover it, but obviously this was a huge game. If you did, could you tell me what Rudi Garcia did in the 2nd half to improve Roma. I know Totti played less as a playmaker and was more #9 while Pjanic replaced him between the lines but I’m not sure. Any thoughts? I think the introduction of Ljajic and Strootman was the big move from Garcia. Changing to 4-2-3-1 allowed more overlaps between Holebas and his winger, instead of the First half’s 4-3-3 shape, and most of the chances (and the second goal) came from there. Strootman was on his natural role (behind the “10″ and the “9″) and created the First goal for Totti. Michael, correct me if I’m wrong. So, is this an admission from Enrique and Barcelona that Messi as a false 9 and Xavi’s patient passing (the two cradles of tiki-taka) don’t work against Atletico? “During Barcelona’s many meetings with Atletico last season, Messi was surprisingly frustrating with his movement, usually starting centrally and making movements towards the play, into the zone occupied by Atletico’s midfielders. He wasn’t particularly keen to move laterally: sometimes drifting wide to the right but doing with little urgency, and unable to make runs in behind because Atletico defended so deep. And Michael is right in that. Suarez has played this position much during last year in Liverpool, Messi is great (also) as a winger, and Enrique finally found the right way to use his three forwards to their maximum strengths. Practically, Barca played Atletico six times last season with Messi as a false 9, and didn’t manage a single win. Barca played Atletico once this season with Messi as a winger, and got a resounding win (it could’ve been more than 3-1, for sure). Not saying it doesn’t work, I’m just saying it didn’t work against Atletico last season. And of course Barca have many different ways of breaking crowded defences, no one says the opposite. Well, no surprise that a false nine works best against a team that gives space between the lines. Atletico is not such a team, they are very compact. A striker who makes horizontal movement may create some gaps for the wingers or midfielder. Like johnny said, Barca has different weapons. But let’s see how Enrique gets this power to the road each game. Thank you for coming back. 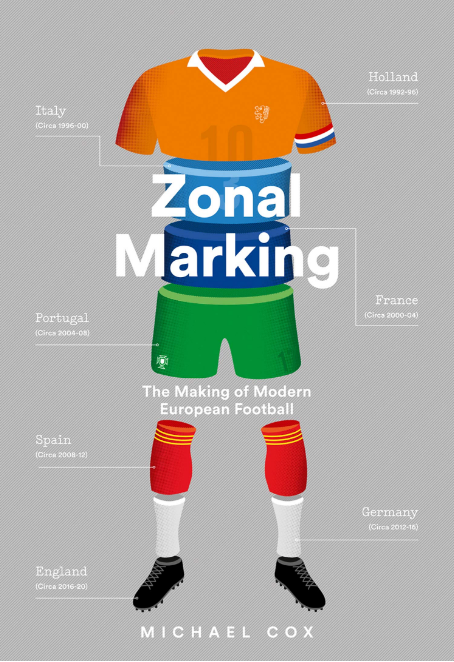 Zonal marking in my opinion is still the best thought provoking match analysis I can find on the net.